A Top-Five Leading First Crop Sire of 2018, Dash Master Jess will stand the 2019 season at Dunn Ranch near Wynnewood, Oklahoma. WYNNEWOOD, OK—AUGUST 13, 2018—Dash Master Jess SI 103, a Grade 2 winning son of leading sire Mr Jess Perry, will stand the 2019 season at Dunn Ranch in Wynnewood, Oklahoma. His fee will be announced this fall. Owned-and-raced by Cesar Rosales, Dash Master Jess' first crop began racing this year. He is currently the #5 Leading First-Crop Sire of Money Earners for 2018. From limited starters he has sired 5 winners, 4 black type (24%) with average earnings per starter of $9,085. His top performers include Hot Beer SI 90 ($53,411 3rd TQHA Sale Futurity-RG3), Jess Master Angel SI 94 (winner, $35,504, finalist Sam Houston Futurity-G2, TQHA Sale Futurity-RG3), Dashing Sweet Brujo SI 92 (winner, $15,364 2nd Gillespie County Fair Firecracker Futurity) Elite Connection SI 90 ($11,345 2nd Sam Houston Juvenile S., etc.). Dash Master Angel SI 81 ($8,716, finalist Heritage Place Juvenile) Centurion D Master SI 94 (2 wins, $7,322), Notorious Brown SI 96, f. (2 wins, $7,174 3rd-Clasico The Prize(MEX)), Won Brave Heart SI 89 (winner, $7,140), etc. 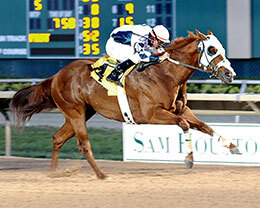 Dash Master Jess, under jockey Manuel Gutierrez, romps to 1-¼ length victory in the Grade 2 Sam Houston Championship at Sam Houston Race Park. Unraced at 2, Dash Master Jess won or placed in 12 of 20 starts at 3 and 4, earning $275,697. He won the Sam Houston Championship Challenge(G2), Hialeah Derby, and Hialeah Invitational Championship. He was second in the Sam Houston Derby Challenge and third in the Sawgrass Stakes. Dash Master Jess was also a finalist in Texas Classic Derby(G1), AQHA Challenge Championship S.(G1), Remington Park Invitational Championship(G1), and Prairie Meadows Derby Challenge(G3). A $210,000 Ruidoso Select Sale graduate, Dash Master Jess is by leading sire Mr Jess Perry, a "sire of sires" who currently has six sons in the top 20 Leading Sires of Money Earners for 2018 including #1 Leading Sire Apollitical Jess. Dash Master Jess is out of the Grade 1 winning Dash For Destiny mare Dash Master Miss SI 108 (249,430), dam of 28 ROM, 24 winners, 11 black type including two-time AQHA Racing Champion Significant Speed SI 105 ($517,505), Grade 1 winner Push The Pace SI 105 ($513,119), G2-winner Dash Master Jess SI 103 (see above), G1 winner Lil Famous Dash SI 102 ($157,924), stakes winner and G1-placed Significant Cartel SI 97 ($132,333), stakes winner and G3-placed Front Running Speed SI 105 ($73,542), G3 winner Getting Even SI 89 ($38,221), etc. 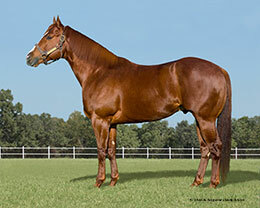 Dash Master Miss is also the granddam or great-grandam of AQHA Racing Champion Significant Heart SI 98 ($257,292), Ruidoso Futurity(G1) winner Jess Significant SI 103 ($419,635), Grade 2 winner So Significant SI 95 ($103,708), etc. The second dam, Uno Mas Tiempo SI 96 by Master Hand (TB) is a stakes-producing half-sister to stakes winners Charge It Mama SI 91, Salty Alibi SI 92 and stakes-placed Copasetti SI 96. For additional information or breeding contracts contact Dunn Ranch at 580-279-6666 or Matt Dunn at 314-960-3260.